SuperSync has a powerful utility to help track down modified tracks that differ in two libraries. The Meta Data Updater allows you to find tracks that contain the same music data but the meta tags are different. Meta tags are fields inside a music or video track that describe the data on the track. For instance, album name, artist, genre, track number, disc number, year, composer, etc are all MP3 tags. Ratings and Played Counts is meta data that is only stored by iTunes, but can still be tracked and sync'ed by SuperSync. You have one track in two libraries. But in one library, you modify some of the tags -- for instance you correct the spelling of the artist. The next time you connect to both using SuperSync, those two tracks should show as sync 'd with the meta data mismatch flag set. 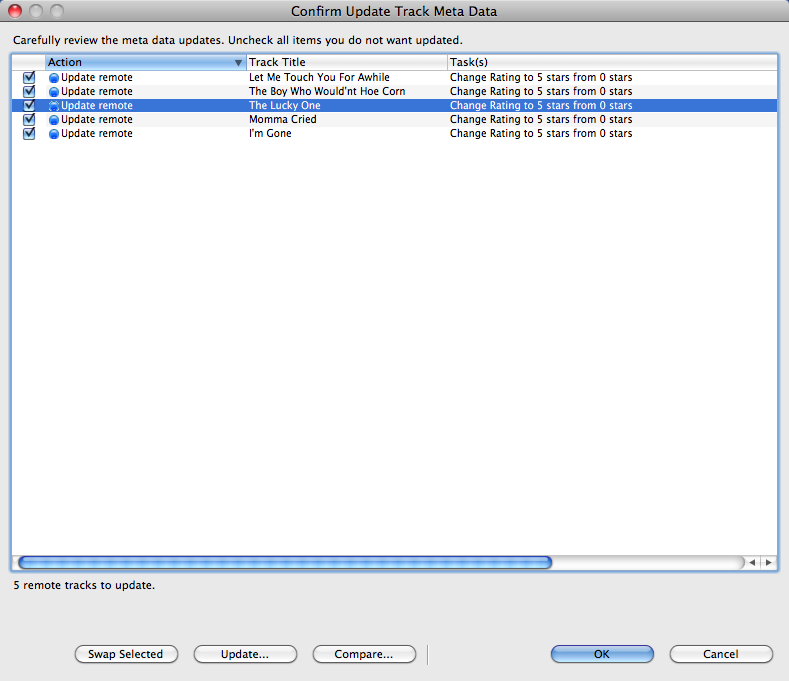 To sync the meta data on both libraries, you would select the track that has the meta mismatch flag icon set, and right click on the track (or use the Action menu) to select "Update Meta Data". A dialog will let you verify the direction of the tag updates (updating the local or remote library version). Click yes to confirm and the file should be updated in SuperSync and in iTunes in both libraries. To see the differences between the tracks, select the track and use the "Compare Tracks" under the Action menu. The Compare Tracks feature can be used to compare any two selected tracks, or if only one track is selected, it will let you compare the closest match. Use Get Info to access all similar tracks associated with a track. This feature it will modify the tags of your music. Use only on a few tracks at a time and verify the changes are what you expect. To use Meta Data Updating, you need to sync between two networked SuperSync applications. Both SuperSync applications must have their Local Library be configured as an iTunes library. An upload password is required, and the "server" must be configured to allow remote changes. Configure the meta data update feature in SuperSync by going to the Meta Data Settings in the preferences. You can also allow or deny letting remote users modify your meta data in the Upload tab. in the Preferences window. Files that have mismatched meta data will have the icon. Select the track and right-click update meta data or select that from the Action menu. Carefully go through the list of suggested changes. Swap lets you change the direction of changes. SuperSync takes a guess as to what changes you want to make but sometimes you'll may want to to manually change which track you're updating. Once you are satisfied with the checked items, click the OK button to start the process of updating the tracks. Tracks will either be updated on your local iTunes library, or on the networked remote SuperSync/iTunes library. If you want to get more details about a particular track, select the track and click the Update... button. A dialog will display the changes and individual meta tag updates can be enabled or disabled. Swap lets you change the direction of changes. SuperSync takes a guess as to what changes you want to make but sometimes you'll want to manually change which track you're updating. In the rare case where you want to update some items in one direction and other meta data items in the other direction, you can do this by updating the meta data twice - selecting the items to move by checkbox. Get Info... to learn more about the two tracks you are working with. One track will be a local iTunes track. The other will be a remote networked SuperSync library. Yes - Initiates the copy of meta data transfer. This will show a progress dialog until it is complete or returns an error message. No - Skips this item and does not update anything. Cancel - Exits all meta updates if others were selected for updating. Be sure to read the warning dialog and confirm your updates carefully. These changes cannot be undone. If you accidentally set the meta data to an incorrect value, you'll need to manually go into iTunes and update the tags from iTunes get Track Info dialog. Use care when allowing remote updates to your library. Be sure you trust the users who have upload privileges. If you are making changes to your one library but do not want to accidentally modify the other library, you can set your library to read-only access in the Meta Data Settings. SuperSync does not do the actual updating of meta data -- we pass the request to iTunes. If iTunes cannot do it, an error will be returned. Some tracks are not modifiable, so some error messages may be "normal". The UPDATE META DATA command is only available when a) two libraries are connected within SuperSync b) a track is in both libraries but some meta data is different (as shown by the meta data icon) and c) at least one of those tracks is selected. The easiest way to update these tracks is to first select the META DATA MISMATCH view in the SuperSync Filter Tree, select a track and then select the UPDATE META DATA command from the ACTION menu.